If you are at the earliest stages of your Army Aviation career you will be gearing up to take the SIFT Test. One of the most common questions asked by potential test takers is ‘What is a good SIFT Score?’. 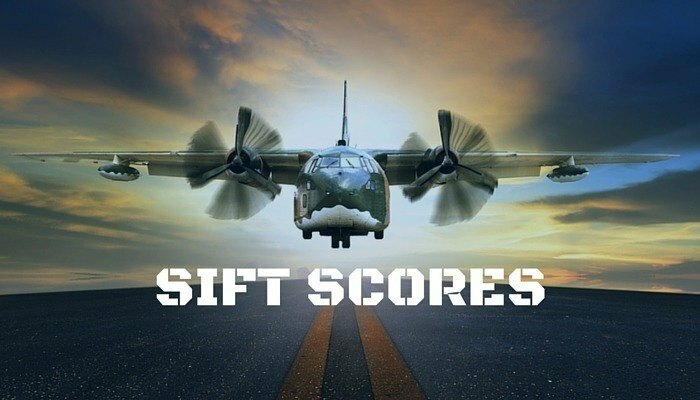 This article will delve deep into the world of SIFT scores and offer insight into the variety of scores you can get – and the probable implications of each. The information on SIFT scores is based off anecdotal evidence from real test takers as the Army doesn’t officially release information about how the SIFT is precisely scored. Read on to discover what constitutes a bad, average and good SIFT score and learn some strategies about how to maximize your scoring potential. Before you can understand what counts as a good SIFT score it is important to grasp SIFT scores in general. The precise weighting given to each of the separate SIFT test sections has not been revealed by the Army. However, the Army has publicly stated that it is possible to compensate for a bad performance in one SIFT test section with a strong performance in another. It is possible to score between 20 and 80 on the SIFT test. 40 is the present minimum score to be considered for aviation selection. The mean SIFT score is 50. The Army has stated that the minimum passing score of 40 could be adapted in the future. Want to Improve Your SIFT Scores? The Complete SIFT Study Guide is the most up-to-date study guide on the market as well as being the cheapest. It has a full practice test as well as diagrams and examples throughout. SIFT Study Guide 2018-2019 is a little pricier than the Complete SIFT Study Guide, and doesn’t offer anything more than what our #1 recommendation does. Therefore, stand to save yourself a couple of dollars AND get more. The Selection Instrument for Flight Training has been designed in a way which is intended to assess a candidate’s general intelligence, their ability to apply knowledge and their aptitude for some fundamental aviation skills. The Army has stated that the SIFT has shown to be a good predictor of future success in aviation. Based on this, we can tell that the SIFT score someone gets will have a strong impact upon their prospect of selection. Because, ultimately, a good SIFT score is one that gets you selected. The minimum passing score for the SIFT is a 40. Therefore, if someone achieves a 40, they are eligible for selection. There have been reports of people being selected with a 40, which shows that it is possible. However, there are several things to note. Firstly, the Army has stated that 50 is an average SIFT score. Therefore, getting a 40 will mark you down as being significantly below average. This will not work in your favor. Secondly, there is no guaranteed score that will get you selected. However, the SIFT is one of the few quantifiable metrics used before training takes place. A strong score can only help your chances. So what is a good SIFT score that will get you selected? This is purely anecdotal, but it seems as if SIFT scores of 60 or higher seem to be a solid benchmark for selection. There are exceptions – if an Aviation department is in particular need then lower SIFT scores can and will be OK. However, it is always best to play it safe and aim as high as possible. If you are able to achieve at least a 60 then you stand a great chance of selection. There are several common reasons that prevent people from achieving a good score on the SIFT. Let’s take a look at some of the key reasons for underachievement and look at simple ways of avoiding these common pitfalls. The first key mistake people make is not appreciating the urgency of getting a good SIFT score the first time round. You are only allowed to take the Selection Instrument for Flight Training a maximum of twice in your lifetime. In addition to this limit, you are only allowed to pass the SIFT once. If you score 40 or above on your first attempt then you are not allowed to take the SIFT again. You are therefore stuck with your first passing score for life. There are some implications to this. Firstly, keep in mind the average SIFT grade is 50. This means that most people will in fact pass the SIFT on their first time of trying. As noted earlier, the preferable minimum SIFT score to aim for is 60. Statistically, we know that most people will pass first time but with a score below 60. There is no prospect of taking the SIFT again and getting a higher score. It is therefore vital to have a comprehensive knowledge of each SIFT section before taking the test for the first time. A SIFT study guide is a great way to gain knowledge in each area and take timed practice tests. Another common mistake lowering SIFT scores is to ignore some sections of the test during preparation. Some people think that the seemingly straightforward aspects of the SIFT, such as Simple Drawings, do not require practice. This is an error. Although what is required for each question is simple, the skill comes in answering a sufficient number of questions within the time limit. It is important to practice even the seemingly simple sections of the SIFT in order to pass them within the time limit. Not understanding the format of any particular SIFT section is another way of harming your SIFT score. For example, some sections have a fixed number of questions, while others have a variable number, depending on your personal performance. Some sections mark you down for a wrong answer while others do not. It is therefore vital to know not only the specific structure and rules for any given section – but also the best test taking strategy to maximize your score. Proper preparation is the key to good performance in the SIFT test. There is no substitute for taking sufficient time to work through and absorb the material in a SIFT study guide. Some older guides are for Aviation tests in general – it is important to make sure you focus on using a guide that is specifically for the SIFT. This is the only way to ensure that all of the information you are learning is relevant. As you are studying for the SIFT, it is important to take practice tests, and to do so under the time limits of the actual test. This will enable you to work out which areas you are stronger and weaker in, and if any timings are a problem. Be sure to leave a sufficient amount of time to read each section of your study guide, take practice tests and undergo corrective study as needed. It is always better to leave more time than to rush in your preparation. Aside from conventional book based studying, there are a few things you can do to boost your chances of getting a good SIFT score. Spending time using a realistic flight simulator program that features helicopter controls will give you an understanding of control components that will help with the AAIT portion of the SIFT. Virtually piloting a helicopter will also help with your ability to envision a craft in flight – a vital skill for the SAT portion of the SIFT. You now know the importance of aiming for the best SIFT score you can get the first time round. You should also be aware that ‘what is a good SIFT score?’ isn’t the best question to ask – instead focus on ‘how can I get a good SIFT score?’ as this preparation based approach will pay dividends on test day. There is no substitute for good old fashioned hard work as you prepare for the SIFT. However, remember to study smart as well as hard. Use a reputable study guide and tactically use practice tests to gauge your strengths and weaknesses. A good SIFT score will be the reward for your efforts – the first step towards an Army Aviation career.